Discussion in 'Rehoming and Adoption' started by FFH, Jun 5, 2017. 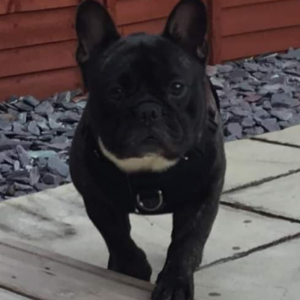 Rico is a sweet 2-year-old French Bulldog, who needs to be with a female carer as he’s wary of men. He must be an only dog with no cats and no children. 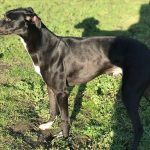 He’s currently in foster in Wisbech, Cambridgeshire and potential adopters must be prepared to visit him there several times to meet him and build trust with him. Rico is neutered and vaccinated. He’s used to being left alone for up to 5 hours and is comfortable in a crate. 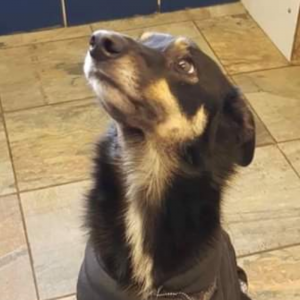 This is sweet little Zorro who is in kennels at Underheugh in West Scotland. 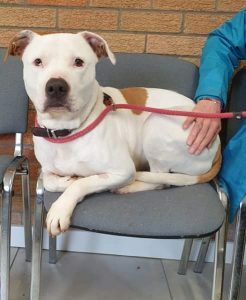 He’s only 11 months old, and he’s friendly and good with dogs but sadly, like many young pups in rescue, he has no manners and hasn’t had the necessary training and socialisation so any resident dog would need to be tolerant of his puppy like ways in an 11 month old dog. He’s young enough still to learn but you need to be patient and caring enough to help him. 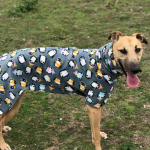 He’s wonderful with people and has good basic training so just needs an understanding home to help him learn to curb his excitement and exuberant playfulness. 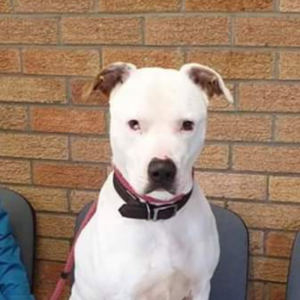 He needs to find a new home, foster or furever, as soon as possible as he’s spent enough time in kennels before moving to rescue in Port Glasgow. 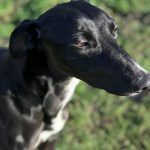 Please note that Underheugh are looking for a home for him in Scotland, ideally around Glasgow/Renfrewshire/North Ayrshire areas but as far north as Perth and as far down to the Borders. Please note, none of the dogs with no known history are rehomed to families with children under 10 so please check this doesn’t exclude you before applying. 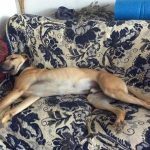 Please complete the enquiry form if you can give little Zorro the home he deserves. 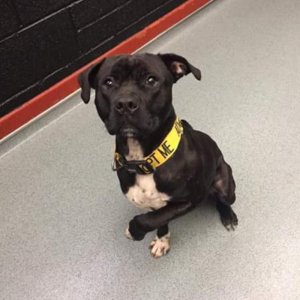 MARLEY IS ON HOME TRIAL! This is Xena, a beautiful bully mix girl who is only 5 months old. She’s not had the best start in life, having broken her leg really badly at such a young age. She’s healing well, but she does have mobility issues, which mean she can’t cope with many stairs. 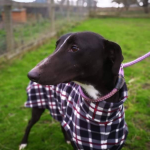 Xena is just a baby and is still learning manners so she needs an experienced new home as she can get a bit pushy with other dogs, although she does get on well with others. She has not been cat tested. Xena needs a calm, quiet environment in which she can continue to heal and grow, as well as learning boundaries. In the right home she can develop into the amazing pet and companion we know she can be. Do you know a place where she can do this? She’s only young so has plenty of scope for learning and developing. 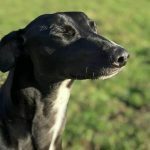 Please note that Underheugh will rehome Xena basically anywhere in Scotland as far north as Perth and as far south as the Borders, for the right home BUT you must be prepared to work with her and take advice from the rescue. Also, Underheugh don’t rehome to families with children under 10 so please make sure this factor doesn’t exclude you before applying. 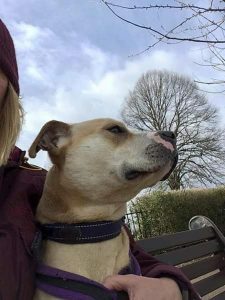 Skye is a big girl, a 2/3 year old Staffie x something, but despite her size, she’s a gentle soul. She’s wonderful with people and very curious about other dogs but not aggressive in any way. She hasn’t been cat tested as yet. Please note that Underheugh prefer to rehome in the Glasgow/Renfrewshire/North Ayrshire areas so they can be on hand to support the needs of dogs moving into their furever homes. Also, Underheugh don’t rehome to families with children under 10. 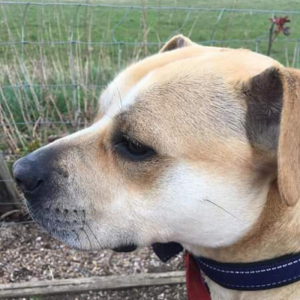 Eddie is a 4-year-old Staffie x American Bull Mix who had been in kennels for 2 years before being moved to Underheugh kennels in West Scotland and has had a tough time of it. When he arrived he was a very, very scared little boy and wary of people. He was worried about this strange place he’d been moved to and needed lots of reassurance. 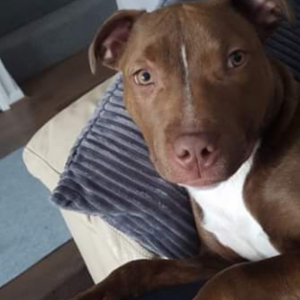 After 2 long years in a kennel he’s lost confidence and coping skills but hopefully his move to Port Glasgow will give him a fresh start and chance to develop again. Not surprisingly after being shut away he’s not good with other dogs, and needs a home as the only pet and with no children. He is house trained, neutered, vaccinated and chipped. Eddie loves to play with soft toys. 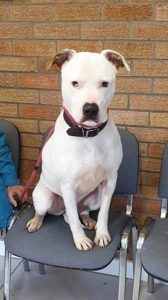 Eddie needs a very experienced but quiet foster or furever home and this will need to be an adult only home. He just needs someone that can show him the world is not always a scary place and who will help slowly and carefully introduce him to the big wide world again. 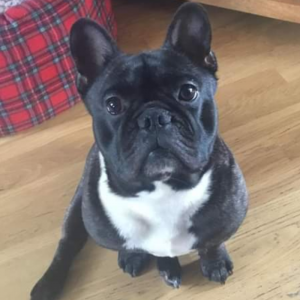 Please note that Underheugh will only rehome Eddie in the Glasgow/Renfrewshire/North Ayrshire area so that they are on hand to support the needs of any dog moving into a home. 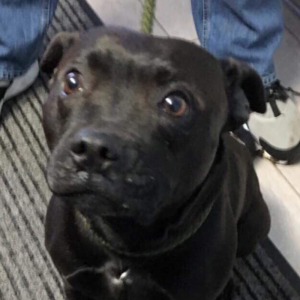 This is Ebony, an 18 month old Staffie who was originally in another rescue before being transferred to Underheugh Rescue in West Scotland. She’s a very sweet girl and travelled with another dog with no issues. While she was in a home she was well-mannered, clean and great with people. 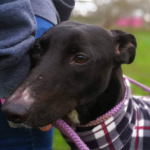 She’s still undergoing assessment for now but she’ll be looking for her new furever home soon. Please note that Underheugh prefer to rehome in the Glasgow/Renfrewshire/North Ayrshire areas so that they are on hand with ongoing support if needed after adoption. 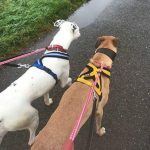 They also usually only rehome to families with children over 10 unless they know the dog’s full history. Meet Aura, a 5 year old Staffie Cross. Isn’t she a brindle beauty? She’s good with other dogs but she won’t stand for any nonsense if another dog has a go at her. Poor Aura hasn’t has a great time recently. The dog warden caught her as a stray and they nearly put her to sleep even though she’s a sweet, friendly girl who is now with Underheugh Rescue in West Scotland. She needs a calm, quiet home to help her recover from her recent trials. She has not been cat tested as yet. Please note that Underheugh prefer to rehome in the Glasgow/Renfrewshire/North Ayrshire areas so that they can give ongoing support if needed once adopted. They also only rehome to families with children over 10 years old, unless they know the full history of the dog. 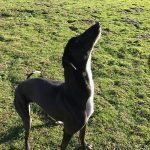 This is the lovely Jasper who is a stunning lurcher aged about 6 years old. 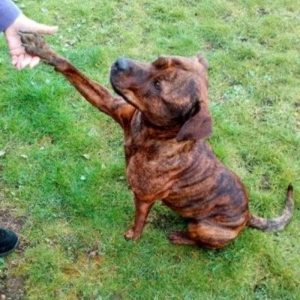 He is so friendly, very laid back and absolutely loves a cuddle. 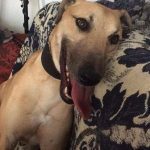 He has lovely manners and walks so well on the lead, is clean in the house and would benefit from another hound, females are his favourites! Jasper is neutered and up to date with his vaccinations. He is dog friendly however he cannot be homed with very small dogs, cats or other small furries. He does like to play a little ball – he even managed to retrieve a ball or 3, clever lad! He is now in Cambridge in rescue at Bruno’s Animal Haven, looking for a foster or ‘foster to adopt’ home. 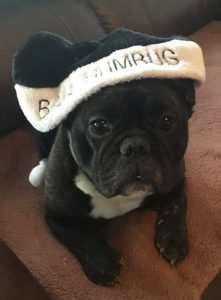 Bruno’s dogs can be rehomed nationwide for the right home. 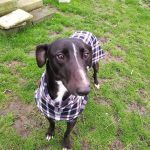 This is Sidney who is a 5 year old Lurcher, a quiet lad who can be quite shy at first but can be won over quickly with treats. He walks nicely on the lead and enjoy off lead playtimes in the secure field but if he knows we have treats he’ll follow us around sniffing our pockets! 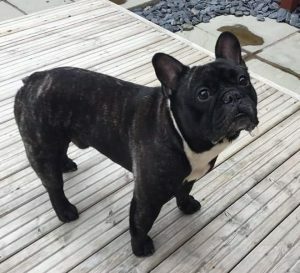 Sid is neutered and up to date with all his vaccinations and is in rescue in Cambridge with Bruno’s Animal Haven. Their dogs can be rehomed nationwide for the right home. 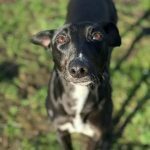 This is Bob, he is Lurcher of about 4 years old and he is an absolute stunner. He is extremely affectionate to everyone and he walks brilliantly on the lead. 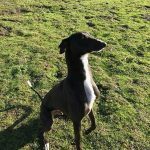 He has been getting used to the sighs and sounds on the farm and enjoys his off lead play times in a secure field and doesn’t really pay much attention to the pigs, goats, geese and chickens on the other side of the fence while he has a human to play with. 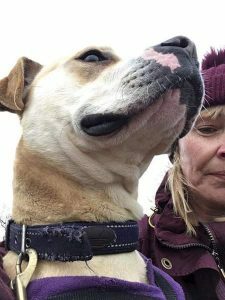 He has walked happily past calm dogs without issue but this is a work in progress, we love spending time with Bob and he is an absolute pleasure to be with. Bob is needs a child and pet free home where he can lap up all the attention and get lots of cuddles. 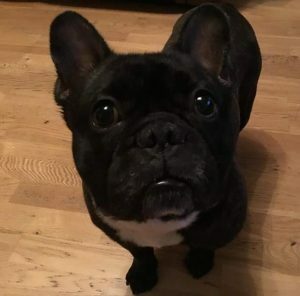 Bob is neutered and up to date with his vaccinations and is with Bruno’s Animal Haven in Cambridge, but he can be rehomed nationwide to the right home.